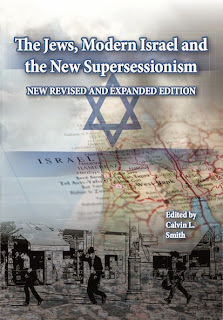 Calvin L. Smith: Revision of "The Jews, Modern Israel and the New Supercessionism"
Revision of "The Jews, Modern Israel and the New Supercessionism"
I'm currently revising The Jews, Modern Israel and the New Supercessionism: Resources for Christians for publication later in the year. Details of the first edition can be found here. With print runs exhausted in the UK, US and Australia (1200+ copies sold so far since publication in May 2009), the revised version will be updated and expanded to include several new chapters. So far I've received new material from Steve Maltz, who examines the roots of replacement theology, and Ron Diprose, author of Israel and the Church: The Origin and Effects of Replacement Theology, who explores and challenges those who claim the New Testament is essentially supercessionist. I'm really excited about this revision which, together with additional material, will continue to provide useful resources for Christians seeking to understand and challenge supercessionism. Keep an eye on both this and the Church and Israel site above for forthcoming details of publication.